We have regularly been using AA2B Couriers Ltd since Anthony answered our SOS call a few months ago, We needed an urgent delivery covering and all our drivers were busy and Anthony stepped up, collected & delivered on time and was very informative along the way – since this time AA2B Couriers seem to have slotted in well with our Day 2 Day operations and is used on a regular basis almost as if one of our own drivers, Our customer like his attitude, politeness and we like his reliability – something which is hard to find in a sub-contractor these days! AA2B Couriers provide an excellent courier service. Anthony is someone that you can trust. They are a business that works around you. I would definately recommend AA2B Couriers. Steve – Managing Director – Print – August 2016. AA2B are a very professional company and Anthony is always a pleasure to work with. 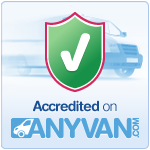 We have been using them now for nearly 2 years and they are always on time and polite. I would highly recommend.